Orientation is a phase during which you introduce new employees of the organization to the existing ones, make them familiar with their job descriptions, help them in understanding company policies and rules, and most importantly welcoming them with open hands. The initial phase of the new workers requires training and assistance which is essential for their skill development. As the new employees are not familiar with the safety hazards, it becomes even more important for the supervisors to pay special care for their safety needs. It is the duty of the supervisor to enlighten new workers about the goals and vision of the company. But it is not always that simple. There are surely lots of things which you need to remember each day as the orientation phase moves ahead. 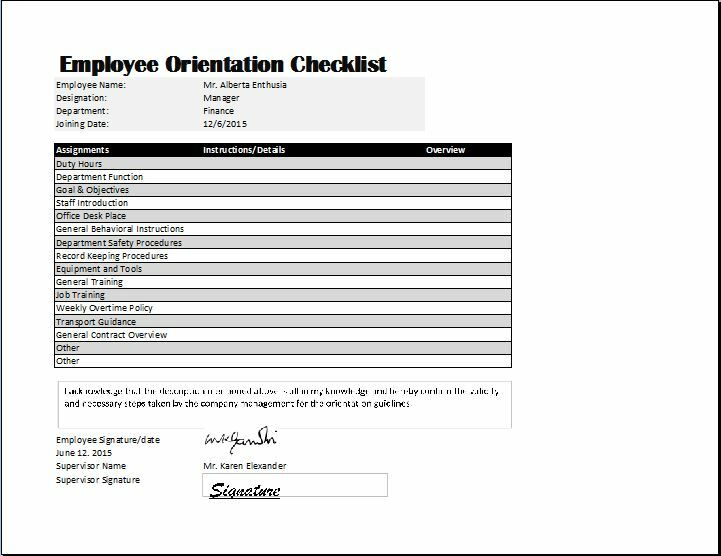 An employee orientation checklist is a great tool for supervisors who want to enhance their employees’ orientation phase. It helps them in introducing new workers with the new environment in a most splendid way. He should discuss with new workers, the company policy, working hours, procedures, safety hazards, duties, etc.